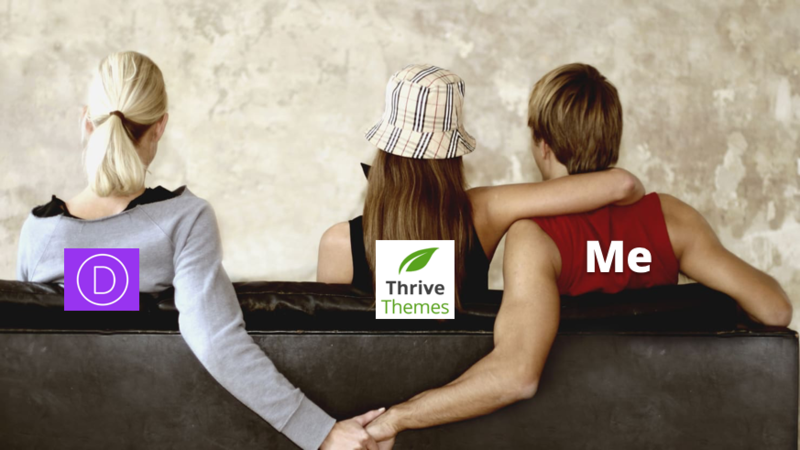 I make most of my living out of Thrive themes and their plugins. Almost all of my clients use it. But even after my 3rd renewal of my annual subscription with Thrive themes, I still will NOT call them one word – reliable. Time and time again, since their early versions, they have been consistently overselling their capabilities, and shipping products that are buggy. Perhaps its because I use it to manage multiple clients’ online businesses at a time. And an average user would use it only on 1 website at a time. Maybe, I’m a minority. Naturally, I always keep an eye open for another, more reliable tool that could potentially save a lot of my headaches from Thrive Themes. I tried Divi builder once (before Thrive Architect came out), and definitely found my first experience delightful. It was perfect to build beautiful websites, without having to adjust things like padding, margins as their default settings were perfectly designed. Looks like one of Divi’s core goal was aesthetics, and hence many of the design decisions has been already made for you, by adapting best design practices out of the box. Of course they allow you to change all of it. But I hardly did. I built a beautiful webpage pretty fast. And more surprisingly I didn’t run into a single bug. You might laugh reading this, but for me, after working with Thrive Content Builder for so long, this was a luxurious experience. But why haven’t I switched to Divi yet you ask? Two reasons – Familiarity and Cost of Change. You see Thrive themes as a company is building a platform. They are a platform like Amazon, Google, Apple or Microsoft is. They don’t consider themselves a software or a tools company. Shane is someone I respect and learn from. He is very smart and right about this strategy. Their platform design and strategy will seduce and attract every online marketing business out there. And make them marry their platform, not just have casual no-string-attached fun. And when you break off a marriage, its going to cost you. In various multiple ways. Their plugins are designed to be used with each other seamlessly. Once you are in, you find yourself using all or most of their plugins – Thrive Comments, Thrive Architect, Thrive Ultimatum, Thrive Leads, Thrive Ovation, Apprentice, Quiz Builder, Headline Optimizer and Clever Widgets. Now let’s say someone like me updates a client’s website to Thrive architect 2.0 and all hell breaks lose. I write a blog post bitching about it, share my frustration with clients on project update calls, and then… go back to continue fixing the bug, finding workarounds and then do intensive yoga at the end of the day to get rid of all the stress caused during my work day. Because, its not just a matter of finding a replacement for Thrive Architect. I can’t just swap Thrive Architect with Divi Page Builder. No. There are 15 lead groups with multiple optins, 6 Thrive light boxes and few Thrive Lead short codes with content locking setup on my client’s website. Buttons on various Thrive Architect pages launch many of them. The Thrive Comments plugin is already linked to Thrive Ovation. And my Thrive Architect page displays the Thrive Ovation testimonials with features supported only by Thrive Architect. Is Divi Page Builder going to display those? Noooo…. And what about Thrive Ultimatum and its integrations with Thrive Architect and Thrive Leads? So switching to any of the alternatives will mean, finding a replacement for all the rest of their plugins. Yes, they advertise that their plugins work independently blah, blah, blah. Devil is in the fine-print here. And they have been unstoppable. Plugins like Thrive Apprentice and Thrive Comments are perfect examples of their company’s long term strategy. This means their customer base is growing faster than ever. They have been eating market shares of other competitors. And that ultimately translates to more business and clients for consultants like me. So will I switch from their tools? You tell me. Hey there Rjavanya, I like the way you write! Your article on Thrive and Woocommerce was spot on – I’m going to roll with your suggestion. Thanks for dropping by Paddy. I’ve also tried Elementor recently, its definitely stable and good, but not ready to replace thrive architect. Also Thrive architect is getting very stable day by day. But ultimately I stick to my new stack of using all of Thrive themes plugins (not their themes) with Genesis framework + ‘Dynamik’ from CobaltApps combo to get easy customisations and branding, yet high speed loading for good SEO points. I am making a new article on it for this week. I found your blog via one of the templates you shared in Thrive. I’m thinking of implementing Thrive’s plugins for my content marketing, so this article spoke to me. I use Drip as my email provider, and so far that is all I use for opt-ins, so anything would be a step up for me. But I like the way Thrive’s plugins work together and their marketing focus. I suspect any tool that is powerful will have some kind of lock in, so I’d be willing to take that leap. Are there any other platforms that you know that offer a similarly powerful suite of tools? Especially ones that work natively with WordPress? Is your primary focus on design? Or would you consider working with a client whose primary need is setting up, optimizing, and managing the Thrive plug-ins? I don’t know of other platforms that provide all the tools like Thrive does. That being said, its been a while since this article was written. Lately for the last 4-5 months I have found myself not even needing to look for other plugins, as they have become more and more stable. Ultimately I’m just looking for dependable, reliable plugins for my clients. I’m the one they count on and not Thrive themes. I guess its only when things used to fail a lot, I was frustrated and kept looking for alternatives. 1. Never update their plugins immediately for major versions. Wait until they become stable. 2. Don’t use their themes. Instead use them with Genesis child themes. Apart from this I have had no problem. My primary focus is providing strategic marketing consultation and implementation of that advice – in terms of design, configuring, customising, additional coding if needed. To answer your question – Yes, I have clients who have a fixed monthly fee for which I maintain their Thrive plugins based site (but usually after I deliver a set of solutions for their business). Let’s get on a call if you want to discuss more detail. Interesting article and comments here. I’m coming from the opposite perspective: started with Divi and then got Thrive Leads …and am now finding myself being sucked into the “Thrive-conversion-optimised-world”. I’m going to get Thrive Membership soon, so I can get hold of all their plugins, but I’m a little concerned as to whether Thrive Architect can sit on my sites alongside the Divi builder safely, or not. If I have both installed, am I going to get issues? While I haven’t tried Divi Builder with Thrive Architect, I have tried to have Elementor with Thrive Architect on the same site and there were no problems. But I assume there might be internal ties between Divi theme and Divi Builder if you use them both. Best is to just ask the guys at Divi or Thrive for a confirmation. From my perspective, I know Thrive Architect in and out, and I can assure from its end, there won’t be any problems. It doesn’t touch any of the pages, which are not edited using it. Thanks for dropping by Jeff. Love your site btw!